A spokesperson from Vietnam’s Ministry of Foreign Affairs affirmed on Thursday that the country does not incarcerate anyone for holding political, social, or religious opinions in opposition to those held by the government. Spokesperson Le Thi Thu Hang stated at a regular press conference in Hanoi that there are no so-called prisoners of conscience in Vietnam and that the government does not imprison people who express personal political views. “In Vietnam, as in other countries around the world, any infringement of the law is subject to stringent punishment in accordance with regulations,” Hang said. 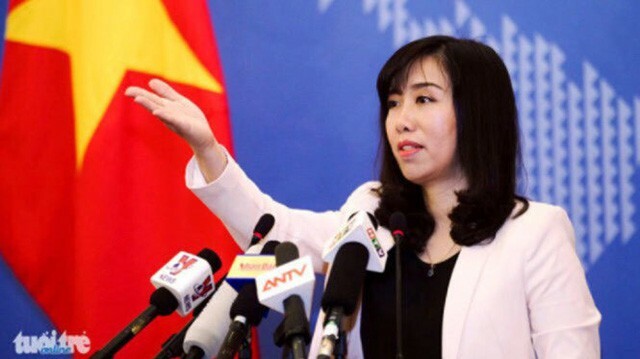 The spokesperson clarified that the guarantee and promotion of human rights is part of the Vietnamese government’s social policies, implemented in conformity with its constitution and law and the international conventions on human rights of which Vietnam is a signatory. The international community has appreciated the country’s efforts and achievements in human rights protection during the past years, she added. The above statement came in response to reporters’ questions regarding criticisms by several human rights watchdogs directed at the country’s charging six of its citizens on counts of subversion. The spokeswoman rejected what she called spurious and prejudiced information from the rights groups. At a lower-court hearing in Hanoi on April 5, these citizens were condemned to seven to fifteen years in prison and expected to be kept under government surveillance after the prison terms. According to the indictment, they colluded with overseas and domestic outlawed organizations, solicited financial support from foreign groups, and clandestinely spread propaganda in an attempt to eventually overthrow the Vietnamese government.